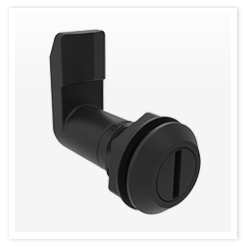 Southco newest E5 Cam Latch features an all plastic design that meets NEMA 4 & IP65 standards for water and dust protection. The Southco plastic E5 provides corrosion resistance and non-conductive latching for industrial machinery, marine, transportation and electrical enclosures. Just like the standard E5 series, the plastic version features various grip lengths and is available a number of head style options for more security.